doi:10.1186/1471-2180-14-39 Cite this article as: Kogenaru et al. 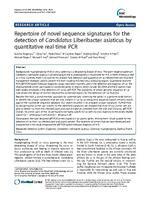 : Repertoire of novel sequence signatures for the detection of Candidatus Liberibacter asiaticus by quantitative real-time PCR. BMC Microbiology 2014 14:39. © 2014 Kogenaru et al. ; licensee BioMed Central Ltd. This is an Open Access article distributed under the terms of the Creative Commons Attribution License (http://creativecommons.org/licenses/by/2.0), which permits unrestricted use, distribution, and reproduction in any medium, provided the original work is properly credited. The Creative Commons Public Domain Dedication waiver (http://creativecommons.org/publicdomain/zero/1.0/) applies to the data made available in this article, unless otherwise stated. Read in the input FASTA file containing multiple entries and run blast for each entry against database specified. P34 CLIBASIA_05505 172 42.44 TCATTAACC AGCGAGGTTGTCCTG ACTTCCTCCGTAGAACTCAGAACC # the target gene locus of each primer pair as indicated in the reference strain Candidatus Liberibacter asiaticus psy62.